The fundamental concept of ESM (Emission Source Microscopy) is application of SAR (Synthetic Aperture Radar) technology to EMC. Fields are scanned in non-reactive near field region (2~3 lambda away from the source), where most evanescent waves died out, processed in k-space for efficiency with the captured phase information, and focused to the DUT surface height to identify propagating wave sources. 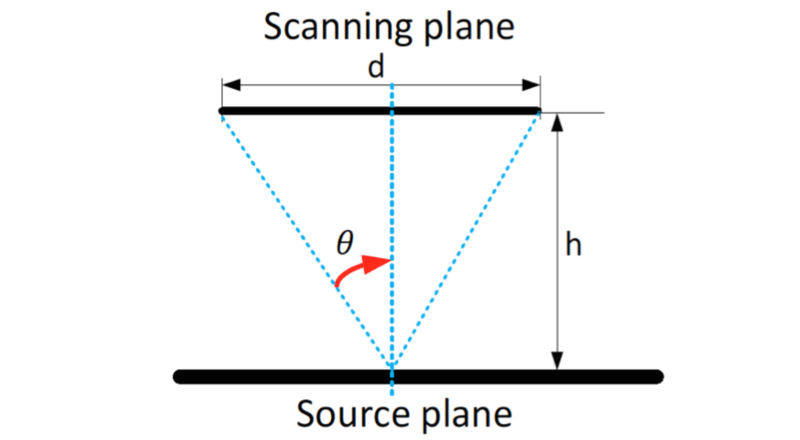 The spatial resolution is limited by Abbe-Diffraction-Limit from optics, and the higher frequencies, the finer the spatial resolution. For more information, please, click on to view the paper. Spatial Resolution R = λ / (2*N.A. ), where N.A. is given by n*sin(θ), n is the refractive index of the medium. API provides two open-ended waveguides with horn antenna for X-band. And the user can prepare waveguides for other bands. There is no software limitation by measured frequencies as long as hardware supports.